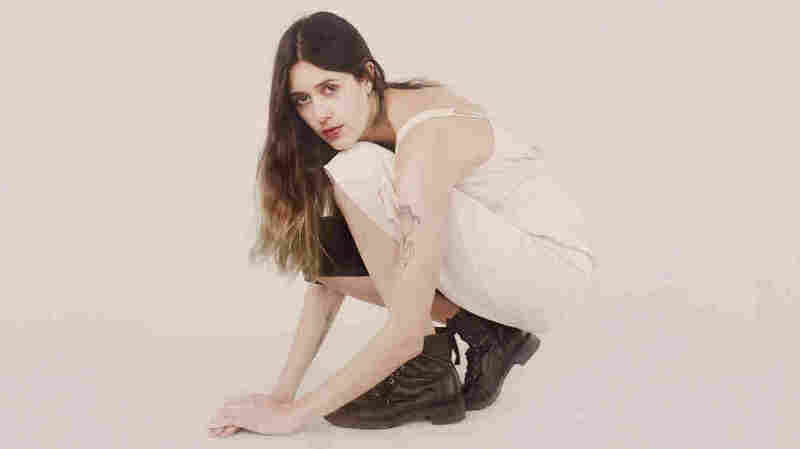 Half Waif's 'Lavender' Offers A Ritual Of Beauty And Purification Lavender shows Nandi Rose Plunkett coming to terms with the reality that pain is often an important intermediary to wisdom. Half Waif's Lavender comes out April 27 on Cascine. Nandi Rose Plunkett is a seeker. As frontwoman of synth-pop outfit Half Waif, Plunkett writes songs that travel profoundly inward — asking questions about who we are and how we relate to each other — over beds of electronic instrumentation that expand and recede like ocean tides. There is a darkness that cuts through Half Waif's songs, hinting at a searching that is often born of loss and struggle. Lavender, the group's latest album, centers on questions of loneliness and isolation, of the consequences of hard-fought wisdom and self-knowledge. Half Waif spent months on the road leading up to the album's recording, and it shows; many of Lavender's songs have a narrator who feels adrift, reaching towards an unattainable sense of home. "You used to say / 'When are you coming back?' / Then came the day / When you no longer asked," Plunkett mourns on "Torches." In an essay about her single "Back In Brooklyn," a stunning piano ballad from the album, Plunkett describes how returning from tour left her feeling isolated and aching: "I was unmoored and questioning everything — not least of all my decision to forgo the stability and community I had cultivated in New York for something more ephemeral ... There is a loneliness about this life that is hard to describe." "Back In Brooklyn" is the most unadorned of Lavender's songs: just Plunkett's voice and the piano (and a brief sample of a New York subway horn). It's perhaps the only place on the record where Plunkett's voice breaks from its classically-trained veneer: For all the impressive clarity and range she demonstrates across the record, there is something nearly heart-stopping about the way her voice cracks as she begs her listener to "listen for me now." Her formal training shines through, too, in the careful stacks of electronic arrangements in these songs and her layers of vocal harmonies. Bandmates Adan Carlo (bass and guitar) and Zack Levine (live drums) add touches that ground and structure the songs, providing a stable base for Plunkett's waves of synths and keyboards. Lavender is, in many ways, an album about isolation, but its inverse threads its way into many songs; themes of connection — specifically, matrilineal connection — appear across the album. The album is named in honor of Plunkett's grandmother, who had a habit of picking lavender from her garden to boil on the stove — a ritual of beauty, but also one of purification, Plunkett believes. On "Salt Candy," Plunkett addresses her beloved maternal figures directly: "I was once a thousand other things now I'm not / I don't understand why / Mother do you recognize your daughter? / Little head so full of big ideas." There's an ache to the song, which — like many on the album — pulls gently on the tangled threads of growth, dependency, the self and family, earnestly seeking an answer yet fearful of triggering a total unraveling. But across its 12 tracks, Lavender shows Plunkett coming to terms with the reality that pain is often an important intermediary to wisdom, that a little unraveling can help let the light in.